Participating in world famous events as the Cannes Midem festival in 2006 – 2011, performing live at the Amsterdam Dance Event 2008 – 2013, in 2012 visiting China for a show at Ibiza Club and a Sunday talk show on Dong-Guan TV, Oded is no stranger to the International music scene. 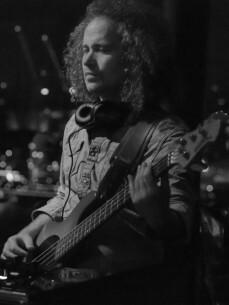 To keep closely in touch with the live feeling of the international dance crowd, as a live musician and as a seasoned bass player, Oded Nir continuous to perform around the globe successfully with his band that includes Amsterdam's King Dread James (Lead singer from the 'Midnight Snacker' Album) and classically trained female singers. The album ‘Midnight Snacker’ contains these live-elements which has become one of Oded’s trademark sounds over the years. One of Oded's latest tracks, 'Power Of The Hair' ft. King Dread James, was released on Happy Music / Universal Music Double CD Compilation 'Brasserie Des Arts St. Tropez 2011' together with the hottest names in the genre in May 2011 and also as a single on Suntree Records in August 2011. Come 2012 with the Amsterdam Dance Event still buzzing from his presence, it is obvious that Oded Nir is more than ready to take the international music scene by storm. His first release of the year, 'Power of the Hair the Remixes', including remixes of The Timewriter, Johnstar and Sydney & Lukez, got up to #47 on Traxsource's Top Downloaded House Chart. His release that came out in the end of May 2012 was called 'Into Your Heart' feat. Hed Kandi singer Gia Mellish with Richard Earnshaw & Dutchican Soul on the remixes hit Traxsource top 10 charts and stayed there for more than 2 weeks and showed to be a 2012 summer house classic. From mid-2012 till date, Oded has focused on bringing his immaculate knowledge and expertise to Suntree Records, where he released original tracks of both new talent and established artists. Today, his efforts have not been without results as he has built Suntree Records to new heights with currently 37 international artists signed to the label. Other highlights of 2013 new remixes for Steven Stone and Wendy Lewis on the Soul Deluxe label, a remix for Berny & Satoshi Fumi that went up to # 58 on Traxsource's Top Downloaded Chillout Chart, and a remix for Meital de Razon and Asi Tal. Additional successful activities of 2013 were the co-compilation and mix of the ‘t Zwin Sluis Autumn Grooves’, a double CD that includes reputable artists such as Richard Earnshaw, Afterlife, the Timewriter, and Edmund. The CD was an instant success as it entered the Beatport Chillout Top100 at #60. Pascal’s remix reached # 11 in Traxsource’s Afro House charts. Finally, this release got featured on the front page of the Turkish I-Tunes shop and climbed there to # 11 in the Dance charts. Oded’s remix for Meital de Razon and Asi Tal’s ‘So Special’ was also doing well in the charts and received great feedback. Other work of Oded this year included a remix for Steven Stone and Pete Simpson (Soul Deluxe Recordings, CH) ‘I Found My Way’ song, This remix received massive support from the Soulful House community, being selected as Traxsource’s Essential and subsequently entered the top Soulful charts on Traxsource. The new track scheduled for release in early August 2014 features American singer Chappell (a. o. Defected Records, Hed Kandi, Hardsoul Pressings) . Oded’s remix for Pascal Morais & Rancido feat. Chappell comes out on Arrecha Records in late August 2014. A new remix package for Oded’s original ‘Into Your Heart’ feat. Gia Mellish is to be released on the Dutch label Drum Mode. Many weekends in 2014 are filled for Oded with residencies at Amsterdam’s finest high –end lounge locations such as 5&33. Like a true music maverick, in between recording sessions, DJ gigs and remixes for world’s top artists, Oded Nir somehow also finds time to run a hugely popular series of international radio shows ranging from the highly acclaimed sceen.fm in Germany to 1FM in USA to Russia , Romania and Denmark as well as a guest show on the Lithuanian radio show Tanzen.